Common opinion is: bride-to-be tries on a dress and knows straight away IT IS THE ONE. I was in a vintage shop and it appears the 70s is my era – which seems apt as my own mum and dad got married in the 70s and I was born in that particular decade. The 70s is often lambasted for its fashion style, but honestly the 80s was much, much worse. Lady Diana’s wedding dress? I rest my case. I loved the first dress I tried on. Made of silk linen, it was very plain and simple. When Lisa (Dragonfly Designs’ very talented owner) added a contrast ribbon to go round the waist, it seemed just perfect, apart from a bit of tightness round the rib cage which is apparently common with vintage dresses as we modern ladies seem to have developed bigger frames. 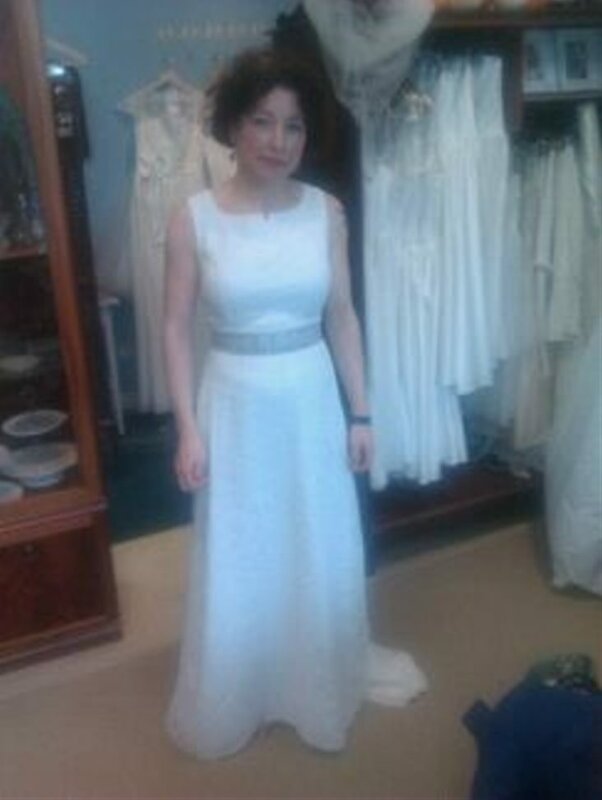 I tried on another dress, which I ‘quite liked’. Everyone else in the party loved it. Lisa agreed with me; she thought the first one I tried on was the best. Ah well, it’s early days yet so I’m going to sleep on it one more night.